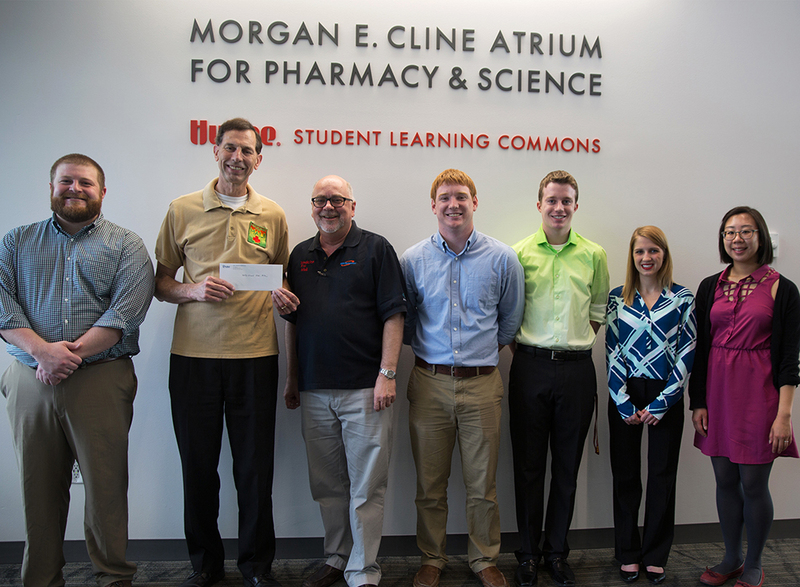 Professor John Rovers, third from left, and Drake students deliver a $4,700 check to Medicine for Mali President Dave Merschman, second from left, on May 8. Students in the Drake University College of Pharmacy and Health Sciences got creative to fundraise money to support Medicine for Mali, a nonprofit organization that provides medical, environmental, education and economic development services to the people of Mali, West Africa. John Rovers, professor of pharmacy practice, traveled with the organization to Mali in 2011, 2012, and 2014. During his last visit, a public health official said the village was in need of a solar-powered refrigerator to properly store vaccines. Rovers put the task to his pharmacy students to raise the money to help provide the people of Mali with the medicine they need. The students responded, raising $4,700, which was enough to not only buy the refrigerator but also to provide support to the family of a public health official in Mali who recently passed away. Students contributed proceeds from an annual auction during Pharmacy and Health Sciences Day. Three service fraternities hosted a fundraiser at their yearly “greek week.” Two P3 students created a Pocket Guide to Non Prescription Medicines to sell to pharmacists and pharmacy students for use in counseling patients. A group of faculty members and students presented the $4,700 check to Medicine for Mali President Dave Merschman on Friday, May 8 in the Cline Atrium. After working to fundraise for Medicine for Mali, Oates said he and other students hope to continue to support their work. “I plan to get involved again over the summer, helping to further spread awareness and raise funds with the help of my classmates, other Drake students, and alumni to allow Medicine for Mali to supply more villages with solar-powered refrigerators, water wells, and other resources,” he said.